This is the first opening theme to the original Pocket Monsters animated series. The song has been remixed more than any other opening theme in the franchise's history. 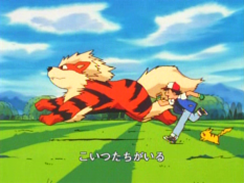 Footage from the opening animation was used for the first English dub opening, Pokémon Theme. Versions of this song also appeared in the video games Pokemon Pinball and Donkey Konga 3. CD('s) found on: Mezase Pokemon Master, Pocket Monsters Sound Anime Collection Ongakushuu Meibamenshuu, Minna de Eranda Pokemon Song & Pokemon Card Pokemon Best Collection, Minna de Eranda Pokemon Song Pokemon Best Collection, Kakurenbo (Regular Edition), Kakurenbo (Limited Edition), Anime Pocket Monsters TV Anime Shudaika Song-shuu Perfect Best 1997-2003, and Pokemon Symphonic Medley / Glory Day ~Kagayaku Sono Hi~. I will definitely catch 'em. To Masara Town I say "sayonara, bye-bye." As I leave on a journey with that one over there ("Pikachu~!"). Who are living life to its fullest. We're tired from our battles, so "oyasumi, goodnight." And the sounds of our battle cries are thunderous. I'll definitely be one someday~! Someone once sung to me. The way a bud blooms into a flower. 1The singer has listed seven different things that she would go through in order to get a pokemon. 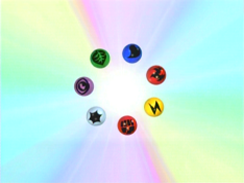 Incidentally, at the time this opening was used, there were seven pokemon types in the trading card game, the symbols of which are displayed as the first verse is being sung. What's also interesting is that most of the seven types - grass, fire, water, lightning, fighting (which incorporates the games' "ground" type), psychic, and colorless - have some kind of counterpart in this verse.